Northern Ireland’s only remaining Victorian era prison, Crumlin Road Gaol has been graded and awarded a five-star visitor attraction rating, indicating that the attraction is operating to an ‘outstanding’ level. The five-star accreditation was awarded under the Tourism NI Quality Grading Scheme which is designed to provide visitors with information on the quality of the experience they can expect at Northern Ireland’s tourist attractions, whilst assisting operators to maintain and continue to improve the quality of their offering. Commenting on Crumlin Road Gaol’s five star grading John McGrillen, Tourism NI Chief Executive commented; “Crumlin Road Gaol is an outstanding attraction and the visitor offering and experience is unique in Northern Ireland. The tours are educating, thought provoking and well balanced and the introduction of a fully licensed restaurant helped Crumlin Road Gaol achieve five-star status. Since opening in 2012 the popular Belfast visitor attraction has welcomed over 600,000 International and national visitors. Director of Crumlin Road Gaol Phelim Devlin said “We are overjoyed to have received the five-star rating for Crumlin Road Gaol Visitor Attraction and Conference Centre. 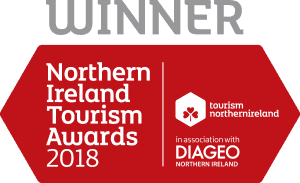 We are one of five visitor attractions to receive this prestigious award which shows us that we are up there with the best visitor attraction in Northern Ireland. This year we have worked hard to improve the visitors experience and with the addition of a new restaurant, Cuffs Bar & Grill, we can now offer visitors the full package.